Pham: I suppose you need to think entrepreneurially in order to represent entrepreneurs. Around that same time, I was involved with the School of Engineering and Applied Sciences over at Harvard, and a number of those professors knew my background in intellectual property and my work in the technology space. Over the years, I’ve formed a good relationship with these professors, and I enjoy helping them to determine the potential commercial implications of their research. I did that with Harvard, with UMass, and various other universities. That’s been going on for about two decades now. When Harvard University launched its Innovation Lab, aka i-Lab, about a decade ago, some of the professors introduced me to the executive director at the i-Lab. Since then, I’ve been going over there on a weekly basis, advising these student entrepreneurs on their projects and the likelihood of success, and looking at the legal aspects of possible business opportunities for them. After working with startups for so many years, I’ve realized that there are four main areas where the founders need assistance: corporate fundraising, IP, immigration, and labor employment. To address this need, we’ve created a team that we can connect with the student entrepreneurs at Harvard or other incubators to help address these questions, by holding office hours, giving a presentation, or networking with the innovators. One day, Northwestern University heard what we were doing at Harvard, and they asked if we could work with their new incubator, The Garage. Since then, I have been flying out to Northwestern University in Evanston pretty regularly to put on seminars and hold office hours. universities that have strong R&D but also have a robust business program. I remember when the School of Engineering and Applied Sciences asked me to address the legal component of commercializing some of the research being done by their professors, and I suggested that they may want to team up with Harvard Business School, because that seemed like a logical gateway. Next thing I know, they have a program, and they invited me to go over and do a little presentation. In addition to Harvard and Northwestern, we engage similarly with Northeastern University’s IDEA program, and a number of other high-profile universities as well. I think this model works well for our Emerging Tech Group and is a benefit to both the schools and the startups coming out of major universities. By combining strong R&D with high-profile business programs, universities can compete more effectively for top students and faculty. Students nowadays are interested in doing startup work, and by creating this type of platform, it is appealing to all involved and everyone wins. Eldon: Tell me more about your work with early stage companies and the services that you provide them and what percentage of your practice that is. Pham: As chair of Greenberg Traurig’s Emerging Technologies Group, my approach is to have specific legal teams in place, whether those are IP, corporate formation, finance, immigration, tax or labor and employment lawyers. This multidisciplinary model enables us to help an early stage company with whatever the company may need as it progresses. As for an example of my work with early-stage companies, I have a client in the medical device space that created a fund. The client’s goal is to determine a market need, then develop a product to meet that need, and subsequently spin out a company around the innovation created. The client team consisted of a number of doctors and one team member who served as CEO. Essentially, the team would identify an area of need, whether it is surgical implants or some other medical product. They then prototype the product. If it works, the information is sent to me. Then we’ll create an entire IP portfolio based on their business objectives. Once some value is generated around the IP, they spin out a company around the IP, raise money, and eventually sell it off to a larger medical device company. We’ve spun out a number of different companies for this fund. The first one was really three years’ worth of work, and they sold it for a significant amount of money. Eldon: Given that you’re oriented around industry sectors where IP is everything, and that you’re based in a life sciences hub, your view is probably pretty different from the consumer internet startups that usually make the headlines in Silicon Valley. When does IP matter for the clients you decide to work with? Pham: Boston is certainly known for its life sciences market, but many of my clients are more on the software or materials side. I divide the world into wet, under which life sciences fall, and dry, under which everything else falls. Regardless of the type of client, I’ve found that most often IP is fairly critical for their success, because as they’re thinking about fundraising, they need a solid IP portfolio for investors to look at because most of these investors, as you know, aren’t going to put money into a company that really doesn’t have any innovation. Eldon: What sort of advice do you give in general to entrepreneurs when they’re just starting out, assuming that they’re in an industry sector where IP is what decides everything? Let’s say you’re talking to a university spin-out. You do a lot of work there, and I know each university has its own policies in terms of of who owns what. So what sort of general advice do you give founders at that early stage of ‘You’re thinking about forming a company. Here’s what you need to have in mind’? Pham: First, I’d say it is important to get all the founders in place and on the same page very early on. We’ve seen so many situations where there’s some internal turmoil before the company even gets off the ground, and then the whole venture falls apart. I typically suggest that each team member be responsible for specific tasks, because not everyone is good at everything. Regarding companies that are spun out or licensing technology from universities, I think it’s worth reminding these companies that they need to think about who is going to own the innovation that’s going to be developed or arise from the licensed technology. If they are not careful with the terms of the license, the university may own all the IP, which is likely not good for a new company. In most cases, the new company should own any new innovation. I also find that many student entrepreneurs are in the United States on an academic F1 Visa. They may not realize that while they may found a startup, an F1 Visa may not allow them to work or be employed by the startup. Therefore consultation with an immigration attorney may be needed. Eldon: Can you tell me a little bit more about the disasters you’ve seen that you warn people against? Pham: I’ll give you one great example involving a trademark issue. A startup company that was in the process of going public wanted to use a particular name but did not end up clearing the name beforehand. Long story short, when the public documents were being prepared, the issue of whether a search was done to see if the name was available came up, and we identified a few that may be problematic. We ended up working overtime to clear a new name so that the filing would not be further delayed. The company now is very diligent with clearing their trademarks. Eldon: Wow. That delayed them going public? Pham: It was a factor. Eldon: Wow. Tell me a little bit more about operationally how you work, like what portion of your clients are early stage and how do you do billing for them? 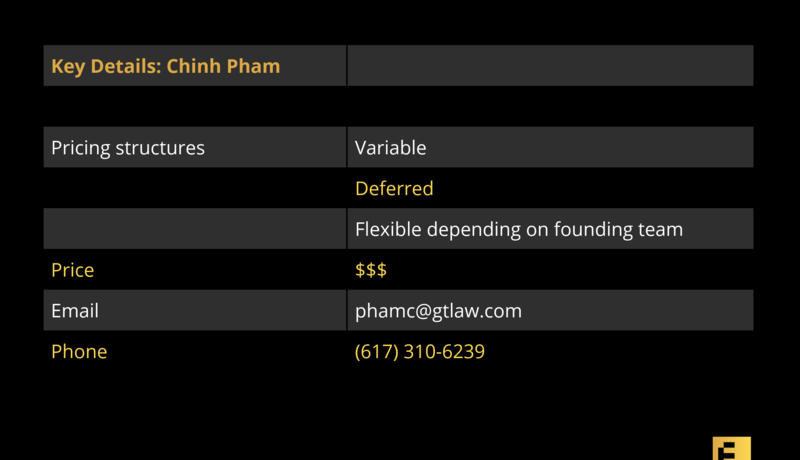 Pham: I represent a wide range of tech companies, from large, multinational corporations to mid-sized companies to startups. Working with early stage companies requires some vetting on our part, based on a number of different criteria that we have developed. Depending on the situation, we can offer a flexible billing structure. At Greenberg Traurig, the billing structure has some flexibility, which is an important benefit to a startup organization. Based on a startup’s specific situation and legal needs, we can do what’s best for that client. Depending on the situation, we may be able to do a deferral, a reduced fee, a hybrid or a combination of other arrangements. Eldon: Can you share any more about your prices, when you’ll decide to do deferred versus some sort of fee, and any more about the specific fee structure that’s normal for you? Pham: Our billing structure is not uniform across the board, because we have 39 offices and more than 100 members in the Emerging Tech Practice Group. I will say the process is fairly flexible. It’s never black and white, but we aim to do what’s best for the startup to help them succeed. “My company is a nanotech materials startup and Chinh not only provided guidance and expertise on intellectual property strategy but also brought his network influence to help us on strategic relationships.” — Mike Masterson, Boston, MA, founder and chairman, ALD NanoSolutions, Inc.